Stepping into The Pink House is a curious combination of being on the set of a magazine shoot and visiting any of my mum-friends at home. And it’s oddly familiar for somewhere I’ve never visited before, because for the past year I’ve been an avid observer of owner Emily Murray’s domestic life through the little squares on my phone – along with 53K+ other fans. When an influential Instagrammer produces video content – as Emily does often – a bizarre one-sided relationship results, because you feel like you know them so well, yet to them you are a stranger. Popping those slightly awkward feelings aside, I knocked on the infamous F&B “Nancy’s Blushes” front door with my artwork in hand. Humbly excusing the boxes in the hallway (she should see mine!…), Emily guided me through to her Insta-famous kitchen, about 75% the way through its transformation. Her children and husband (know anonymously as PHH: Pink House Husband), scurry around and play Marble Run, as Emily and I chat. The space is gorgeous. It really, really is. Individually, there are some beautiful items and quality furnishings, fixtures and fittings. But it is Emily’s surprising and innovative juxtapositions that really make this room quite unlike any other. There are no Insta-cliches here, because she is the trendsetter. 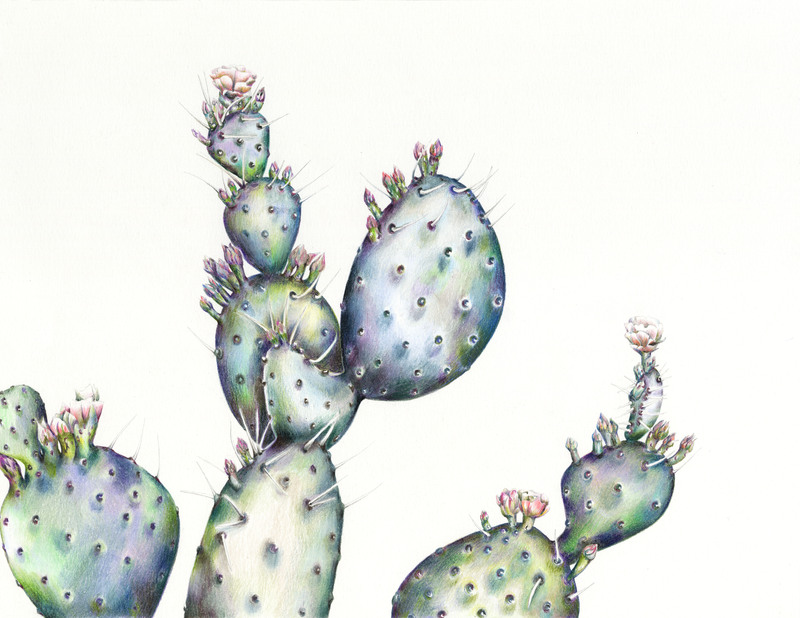 The illustration I presented to Emily is an off-set prickly pear in vivid greens, pinks and purples. I wanted to draw this species because I was so captivated by its varied tones and complex structure, but knew I also wanted to create a modern composition. For me, a drawing like this is perfectly paired with a vintage frame because the result balances old and new in perfect harmony. It is ideal for a period home like Emily’s, which celebrates such a dynamic and playful interior. Now the prickly pear illustration hangs on a candy pink wall in her open-plan family lounge / dining space, alongside both contemporary and vintage botanical illustration prints. I love her interpretation of colour and mixed proportions, especially that oversized hanging plant! 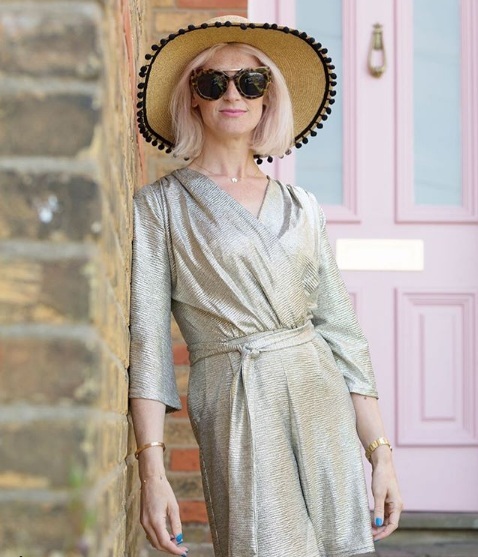 Emily Murray is the author of The Pink House blog, winner of the Interior Blog Awards “Best Written Blog” 2017 and stylist with work featured in Grazia, Glamour and CN Traveller magazines. 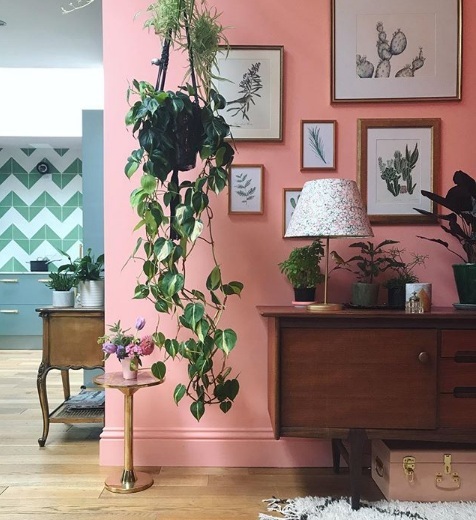 The Pink House won the “Best Wow Factor Interior” award at Pinterest’s inaugural Interior Awards this year. How Do I Create a Unique Botanical Wedding?